← Why do depressed people feel so guilty? Sometimes the inner critic feels so normal we don’t stop to question it. Left unattended it can fuel anxiety, depression and stress. Sometimes we are aware of the inner critic as an old “tape” playing, and may try to tranquilise it with positive affirmations but we don’t end up changing it for good. It influences our self-esteem, our stress levels, our decision-making ability, and our sense of peacefulness in our own skin. It can be these internalised messages that lead people to into serious depressions, panics and even to self-harming. If you feel like your inner critic is strangling you, I suggest you seek professional help since when extreme, and when there’s no strong enough counter-voice, they can be almost impossible to wrestle on your own. 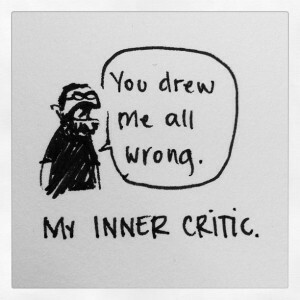 My favourite thing to do with the inner critic is not try to get rid of it, but instead find ways to dialogue or connect with it. Typically the inner critic comes from our past and perhaps was even useful at one point to protect us or motivate us. But it got the wrong end of the stick somehow. Like any opinionated individual it doesn’t like just being pushed aside, it wants to be listened to. Ironically this can diffuse its power. During a Focusing exercise, a client I shall call Dean came up with the image of a prison guard to represent his inner critic. This prison guard loomed close whenever Dean tried to do much of anything to do with work or school or even feeling his feelings. And the guard was sinister: standing ready with a baton raised. No wonder it was hard for Dean to make progress in life or in healing a significant loss. It lead Dean to lots of procrastination and a high level of anxiety. During the exercise I asked Dean to visualise the guard and imagine him at a distance that felt safe. This turned out to be outside the room, in the waiting area. I asked Dean to check what he was aware of inside his body as the guard sat outside. Though there was some anxiety/fear, he said he felt calm enough with me there and the door in between, so we were okay to proceed. I invited Dean to ask the guard “what are you worried about?”. The guard said that he was worried Dean wouldn’t progress in the world. There was a bit more of a back and forth and as Dean listened and validated the guard’s concerns, the guard softened inside and got physically smaller, putting his baton down. Dean was able to express the effect the guard was actually having in his life. The guard was confused but listened. Then we explored if there was a different way the guard could get his needs for Dean’s progress met, and what the guard would need to feel less afraid. Dean was able to reassure the guard that he indeed did want to progress in the world and do well in work and at school. I explained the grieving process to the Guard, and that it was important Dean be able to feel his feelings. The guard seemed to understand and be learning. I talked kindly to the guard too who really represented Dean’s adolescent self (at the time of the major loss) who really didn’t know how to navigate grief or stress but was trying the best he could. As we went on the guard identity no longer felt relevant to Dean and the new image that fit was a kinder Parole Officer (P.O.). The P.O. trusted Dean capacity but was still needing to make sure the ship sailed straight. Dean asked the P.O. for the kind of space and support he needed and together they worked it out. Dean thanked the P.O. for being concerned about him over the years. The P.O. felt happy and respected; he softened further. Dean found a new figure too in the process – a wise Sage cartoon character that he knew from an anime film. The Sage’s presence strengthened Dean became the guide that Dean needed to navigate his grief process. The P.O seemed to turn into the Sage. Dean felt relaxed, lighter and more open in his chest after this dialogue. He felt hopeful that he could navigate the process with a more appropriate and kind guide. During the weeks after the session Dean was able get on with the stuff he wanted to do in life without the anxiety and vigilance that the guard’s presence created. As far as I know the guard did not reappear. Dean felt comfortable to use the same process on his own as needed. For a basic Focusing tool see the Six Steps. This entry was posted in Anxiety, Depression, Guilt, Mindfulness-based psychotherapy, Stress. Bookmark the permalink.